Greek industry has a powerful presence and a promising future; it can constitute a pillar of development for the Greek economy by providing good quality and specialised jobs. That was the strong message from the first Metal Machinery 2018 exhibition of industrial equipment, production technologies and metal processing that closed successfully and has already become an institution for the technical and industrial sector. The exhibition opened on Friday 9th and closed on Sunday 11th November at Metropolitan Expo, in the airport area, and attracted high level exhibitors and thousands of visitors who honoured it and promised to meet again in November 2020, at the 2nd Metal Machinery, with even more participants from Greece and abroad. For 3 days, the 103 high level exhibitors gave thousands of visitors, including industrial and processing industry executives, craftsmen and production sector professionals, the opportunity to see the most modern metal processing machinery and industrial equipment. 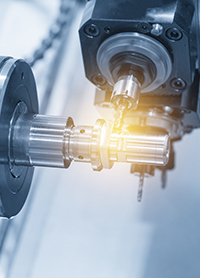 Metal Machinery 2018 proved to be a significant B2B tool. Within the framework of the exhibition, significant business agreements were signed for the sale of high level industrial equipment to both large and small industrial units in Greece. During the exhibition, significant interest in and high demand for specialised solutions that increase productivity and competitiveness, and improve energy efficiency was noted. For modern industry, research and innovation constitute a competitive advantage. Within this framework, the participation of the Manufacturing Technology Laboratory, School of Mechanical Engineering, National Technical University of Athens at Metal Machinery 2018, was unique. Giorgos Vosniakos, Professor and Mechanical Engineering at the NTUO, MSc and PhD, stated that he considers their participation at the exhibition significant, given that it was an opportunity to present their practical market dimension, and also to meet with industry. Special presentations and seminars on the application of modern technologies and digitalisation in industrial processes were organised at the Laboratory’s stand with the participation of a large number of students. Fotis Karvelas, director of Fotis and Dimitris Karvelas OE, who has been involved in the metal machinery and processing trade for 50 years, stated that he was excited and positive about the future of the sector. Metal Machinery 2018 was supported by SEKEM (Panhellenic Association of Dealers and Manufacturers of Metal Processing – Cutting – Welding – Machinery) and held under the auspices of Hellenic Federation of Enterprises (SEV), the Athens Chamber of Commerce and Industry (EBEA), the Piraeus Chamber of Commerce and Industry (EBEP) and the Union of Hellenic Chambers of Commerce (KEEE), while Moisiadis Publications (machine tools, Cutting-Forming-Welding), Moulding magazine and Plant magazine were communication sponsors.